Something that we all love to do is get out of the house and go for an adventure. I've had a ton of beach vacations and weekend getaways this year to learn how to become an expert packer. My brother started his year in England and is ending his year in Guatemela. Currently, Omar is in Korea and will be back in Japan a couple days before Christmas. So yeah, we've got some travelers in the family. 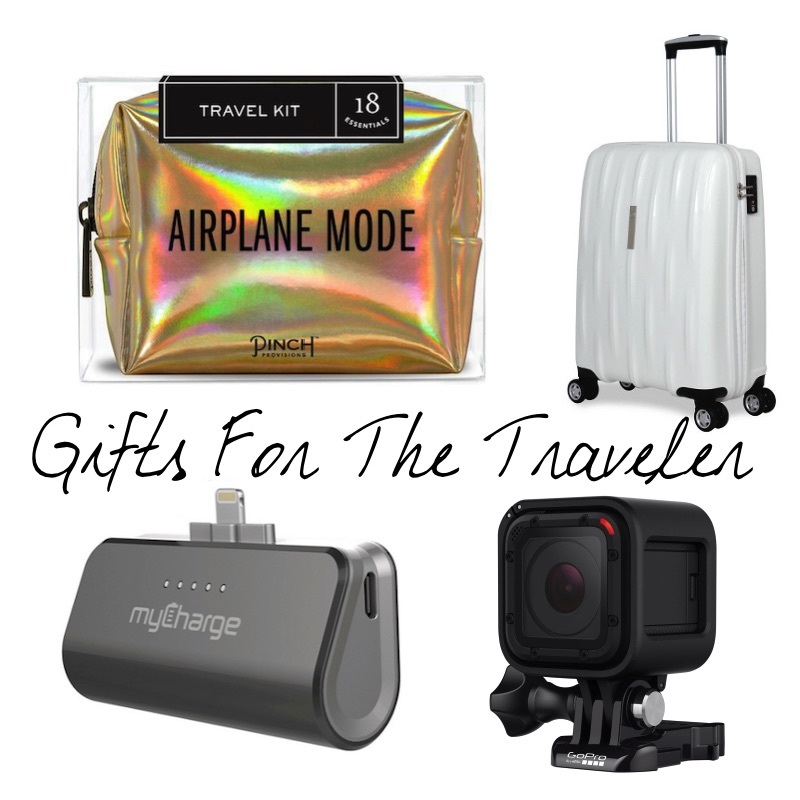 If you've got a traveler in your fam bam, here are some gift ideas for them. One. Suitcase // This might sound like a boring gift, but if you've got someone who is constantly on the go having their own suitcase is or a suitcase set is extremely helpful. Especially the hard case ones. You could even put mini presents inside of the suitcase! It's a win-win. Two. Portable Charger // These are great gifts for anyone, but a traveler really needs one beacuse you never know when your phone will die. It's such a handy tool that would be much appreciated. Three. Camera // If someone you love is always traveling the world the more than likely want to share their experience with you. More than likely they are taking pictures of everything they see. Give them an upgrade this Christmas! There are so many different types of cameras out there that would be a great gift. Including polaroids, GoPro, and digital cameras that could be perfect for that traveler in your life. Four. Comfy Clothes // If someone you know is always traveling that means they are always getting on a plane! Get them some comfy, yet stylish, clothes for them to travel in. Five. Beach Towel // My favorite vacations are the tropical kind. Laying on the beach, swimming in the ocean, and soacking up the sun. One of my go-to items for a beach vacay is a fabulous beach towel. Lucky for you, I'm a Sand Cloud ambassador and if you click this link here you can get 25% off! Six. Emergency Kits // I am a sucker for all things mini. Pinch Provisions has to be my favorite thing in the world though because they've got the perfect combo for any situation. Some of my favorites include the Screen Queen kit, the Festival kit, the Best Night Ever kit, the Fitness kit, the Love You A Latte kit, and of course the original mini kit. They just released the new 'Airplane Mode' kit also! I defintely want the wedding kits on my wedding day. They also have mini kits for guys! The Binge Watching kit and the Golf kit are my top two! What else would you get the traveler in your life?